A group of Lydney people. 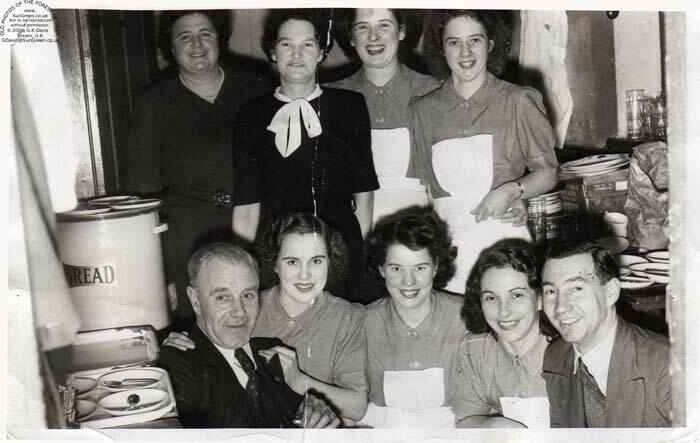 Row 2: 1 Kath Walker (cook), 2 Matron Secretary, 3 Joyce Lang (nee Probert) , 4 Doris Thorn?. Row 1: 1 , 2 Probert?, 3 Gwynneth Slade, 4 , 5 Doug Price. Sue's mother, who's name at the time was Gwynneth Slade, was born 1933. She is the middle person in the front row. We believe the photo was taken in Lydney between 1947/8/9. Doug Price was the electrician at the Hospital at this time. Doug also worked for Forest Battery Service in Newerne St Lydney around this time. If any one can provide any information as to why the photo was taken, provide the date or more names, please click the button below. Thanks also to Mike Smith.